Insider-controlled public companies as a group also have mixed returns. One study found that dual-class firms tend to have higher valuations early in their lifecycles but lower valuations about six years out from the IPO. There was already evidence last year, long before news emerged that as many as 50 million Facebook Inc. (FB - Get Report) users might have had their data gathered and used improperly, that shareholders weren't happy. In June, Roughly 49% of the social media giant's investors, not including embattled CEO Mark Zuckerberg and other insiders, voted to back a shareholder proposal seeking an independent board chairman. However, even with such a big negative vote, Zuckerberg continues to fill both roles. Many governance experts prefer that public companies come with independent chairs, so the boards enjoy independence and distance from the management they are overseeing. However, Zuckerberg isn't accountable to Facebook's outside shareholders because he controls 59.7% of the vote through a dual-class share structure even though he owns much less equity in the company. And according to an analysis produced by relationship mapping service BoardEx, a service of The Deal's parent, TheStreet, Facebook is only one of many dual-class share companies that have poorer governance practices than public corporations that give investors one-vote per share. Consider that the majority of insider-controlled companies, according to BoardEx, have executives or ex-CEOs in the chairman role. Investor critics argue that ex-executive chairmen aren't adequate either, since in many cases they mostly run the show, pushing the CEO to execute their decisions. According to the Council of Institutional Investors, over 230 companies in the Russell 3000, including Action Alerts Plus holding Facebook, have at least two classes of shares with unequal voting rights, as of January. 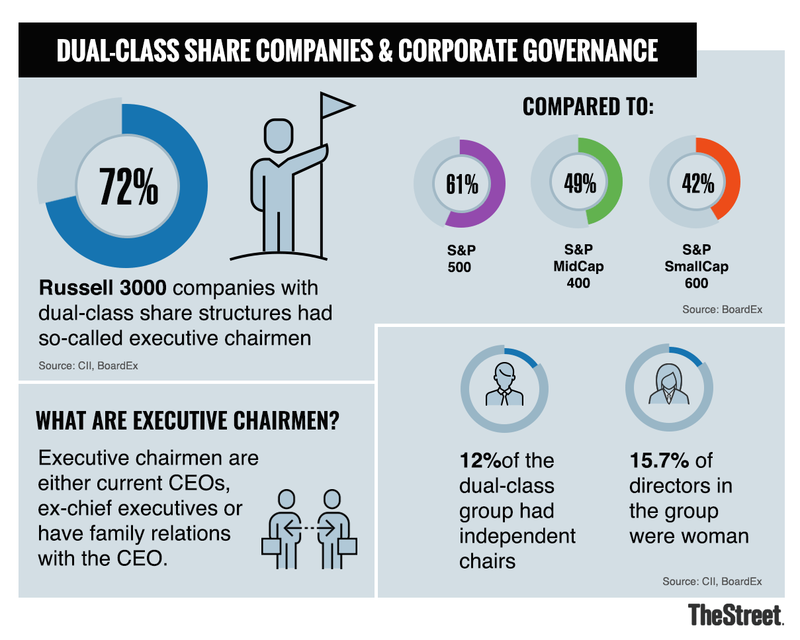 According to BoardEx, 72% of the CII Russell 3000 companies with dual-class share structures had so-called executive chairmen, those chairs that are either current CEOs, ex-chief executives or have family relations with the CEO. That number is much higher than their non-insider controlled peer groups at the S&P 500, S&P MidCap 400 and the S&P SmallCap 600, where 61%, 49% and 42% of boards respectively came with executive chairmen, according to BoardEx. Only 12% of the 230+ insider controlled Russell 3000 companies had independent chairs, according to BoardEx, way below the 30%, 41% and 46% of S&P 500, S&P Mid-Cap and S&P Small cap companies respectively that had independent chairmen. Also, the group of insider-controlled companies was less likely to hold women directors than their peers. According to BoardEx, about 15.7% of directors in the group of insider-controlled companies were women, compared to 23.1%, 19% and 16.3% for the three S&P categories. (Facebook's nine-person board has two women directors, only one of which is independent but we'll have more on that later). Finally, Dual-class share companies as a group have had mixed returns, according to studies examining the issue, including one finding that insider-controlled firms tend to have higher valuations early in their lifecycles but lower valuations at about six years out from the IPO. That study was produced by University of Notre Dame Finance Professor Martijn Cremers and two other academics who examined a matched sample of U.S. dual and single class firms in 1980 to 2015 from the time of their IPO. The study found that at around the time of the IPO dual-class firms have tended to have higher valuations than single-class firms but that their valuation premium dissipates over time and turns into a discount about six years after the IPO. (Facebook is about five-plus years out from its IPO). The Investor Responsibility Research Center, or IRRC, in 2016 issued a report noting that controlled public companies underperformed non-controlled firms over one, three, five and 10-year periods concerning total shareholder returns, return on equity and dividend payout ratios. However, IRRC also found that controlled companies outperformed non-controlled rivals when it came to return on assets. Governance experts argue that if they can't have independent board chairs then at least companies should have strong lead independent directors. Facebook has Sue Desmond-Hellman in the position of lead independent director. However, Institutional Shareholder Services, in a report obtained by TheStreet, urged shareholders in 2016 to vote against her and director colleague Erskine Bowles, for allowing Zuckerberg to introduce Class C non-voting shares. As a result of the new Class of shares "Zuckerberg will... be able to perpetuate his outright control of the company's voting power without maintaining his economic interest for the remainder of his lifetime" ISS said. However, Facebook was sued in Delaware over the new class for breach of fiduciary duty. The lawsuit suggested that there was a flawed review process inside the board's special committee of disinterested directors. In a settlement, right before the trial, in September, Facebook announced it was abandoning the Class C issuance. In 2017, ISS backed a shareholder proposal to require an independent board chairman at Facebook. It also supported a non-binding measure that sought to collapse Facebook's dual-class share structure.